NOT LONG AFTER my novel The Mountain was released in 2008, I had been approached by several people — mostly artists — questioning why I had portrayed my main character, the painter Jake Forscher, as being so reluctant to sell his paintings. Why shouldn’t an artist make a living? Jake (nor I) object to an artist being recompensed for his time, his labor, his materials — but Jake (and I) question whether it is ethically correct for an artist to sell, or make money on, a ‘gift’ that comes to us gratis, so to speak. Like beauty, creative talent comes from outside of ourselves and not from something that comes purely out of our labor (although I really don’t know how much time, money and effort it takes to apply make-up or undergo cosmetic surgery in order to achieve celebrity or praise for how one ‘looks’ rather than ‘does’). Full disclosure, however: My wife does sell my paintings and has been doing so since I began painting about 20-25 years ago, and although I am not fully easy with her doing so, I have not refused to let her do so. For instance, I’ve been a participant in the Annual Saugerties Art Tour for about 5 years and have been present as sales have been made over those years. Yet, it still makes me feel somewhat uneasy seeing my landscapes being taken away, not only because they have come to me unbidden, but because they sort of serve me as a visual diary of how nature affects and inspires me. Often the urge to capture a moment of sunlight heightening a view of my surrounding field and woods often comes ‘out of the blue’ but also from a source that remains a mystery for me. Such moments usually come when I am having a case of writer’s block and need to unclutter my head of words — thus, a moment of an inspired depiction of ‘where I am’, a diary moment that begs to be visually recorded, a moment I can look back on in a future meditative mood. That someone else is ‘moved’ by these personal records is as confounding as it is pleasurable for me. Recent comments such as “your landscapes capture where the heart wants to rest* and “your landscapes sing!”* warm my heart — but ought I ‘market’ them? Sell them? Put a price on them? Take money for sharing what is not properly mine to sell as some kind of tangible commodity? Neither Jake nor I are unique in our feelings about selling what was never ‘ours’ to sell. Many, many artists I have met, profiled and/or critiqued over the years have shared their own misgivings. I recall one vivid memory of spending an overnight at Pier Augusto Breccia’s Rome (Italy) studio, when being wakened by the smell of cigarette smoke. Unbeknownst to me (or Cornelia who traveled with me), Pier came from home to his studio during the late night to make a painting that had suddenly insisted on emerging. We walked next door to his adjoining studio to find him sitting back from a large painting on his easel, smoking and shaking his head. When he heard us approach, he said, “From where does it come? It is always a mystery!” Breccia is world-renowned for what he calls his hermeneutical paintings. Yes, he sells them (at the opening reception we attended a number of years ago at the Palazzo Venezia more than 3000 attended!) but he still doesn’t know where they come from! And, neither do I! Still, art has been sold for thousands of years, and still selling since we’ve totally turned it into a commodity and treated it as a product rather than as an instance of creative insight. Not surprising, I guess, since we’ve denigrated the concept of “divine inspiration” and managed to turn colors and shapes spread (or poured) over a flat surface, piles of debris on gallery floors or urine in jars into ‘art’. Thoughts? * Letters from Rebecca Monroe of Troy, Montana and Sara Jones of NYC, NY, respectively. A trip into the past. To a time when artistic inspiration created beauty instead of political and social agendas, personal angst, or simply meaningless lines, shapes and colors. To a time when the soul could breathe in sublimity instead of constantly having to ward off nonsense and ugliness. To a time, alas, all too lost. Ambling amongst the landscapes of Jervis McEntee at the Samuel Dorsky Museum’s* major exhibition of this long-gone Hudson River “School” plein-airiste can almost make one feel that the past 100 years or so has simply disappeared into a black hole of much-desired forgetfulness. Curated by Lee Vedder and assisted by many helping-hands and lender/contributors, the Exhibition, “Jervis McEntee: Painter – Poet of the Hudson River School”, is comprised of approximately 75 sketches, drawings & paintings tastefully spaced, hung, or displayed throughout several ‘galleries’ of the Dorsky Museum. 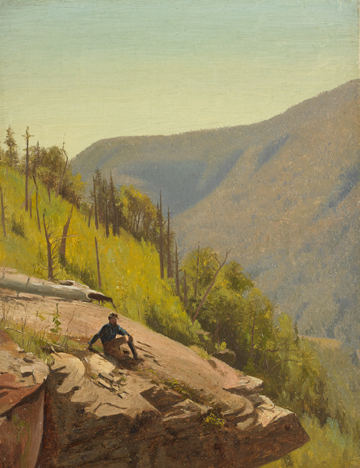 Although McEntee and his fellow landscape artists often sketched and/or painted side-by-side in the Catskill and Adirondack Mountains, even ‘taking lessons’ from one another (McEntee studied for a time with Frederic Edwin Church in New York City, for example) and traveling to Europe jointly during their long-time inter-relationships, the perception that they comprised a “School”, even dubbed as members of a “Hudson River school”, was first used derisively by NYC studio artists to ‘rag’ on their fellows who trekked upstate to tramp through the woods and only so designated as a bona fide “School” much later by over-effusive artwriters that admired the ‘body’ of work these fellows produced and thought it would give them ‘standing’ in the artworld. I use “fellows” here somewhat reservedly, since although there have been a great many women artists in more recent years that have adopted and even deepened the aesthetic sensibilities of the “Hudson River School”, I have never heard or read of any women that did so “back in the day” — however, I stand ready and willing to be informed otherwise. In any event, if one could claim any ‘schooling’ at all, it would have been by European plein-airistes whose growing fame was influencing American landscapists that were bringing back their ideas from their studying and traveling abroad. William Merritt Chase on Long Island in Shinnecock, in fact, founded the first actual plein air ‘school’ in America, undoubtedly influenced by his time at the Munich Academy that had its own “Woodstock” in the nearby town (“municipality”) of Polling, Germany, with the Alps rather than the Catskills as a backdrop. 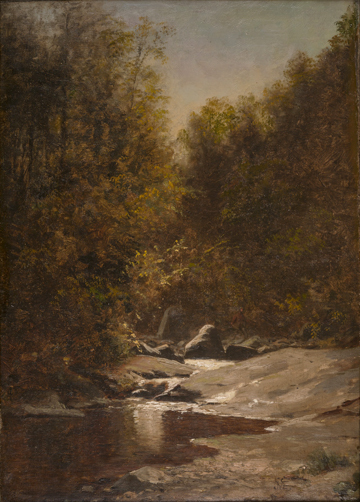 Along with the growing interest in painting on site outside of the studio, came the romanticism fostered by those writers in England such as critics like John Ruskin or poets like Wordsworth and painters like the “Brotherhood of Pre-Raphaelities” and their creed of “Truth to Nature” — incidentally, calling the Hudson River/Catskill artists a “brotherhood” would be far more apt than decreeing them a “School” — and, in Germany, painters like Caspar David Friedrich and his fellow romanticists, the ‘Nazarenes’, who found their inspiration by following the “finger of God” in Nature and who came before the impact of the French Impressionists. As this show makes abundantly clear, Jervis McEntee was inspired by Nature; both European and English aesthetes taught “what God had made beautiful, ought not be made ugly” and a great many landscapists both here and abroad took the lesson to heart. While McEntee and his fellow landscapists evidently imbibed the love and inspiration that their European predecessors had for Nature, it is a bit less clear that they were more often than not concentrated on a European Nature rather than an American one. As any traveler knows, European countries (and countrysides) have been inhabited by humans and have felt their impact for centuries; by comparison, again as any traveler knows, our landscape is considerably ‘wilder’, untamed, even in much of Catskill landscape, downright “unkempt”. Of course, there are extremes in both countries, but it would take a good many years and much labor to transform the woodland surrounding my home in High Woods, New York to resemble one-one thousandth the amount of manicured gardens of, say, Versailles. Even my strolls through Germany’s Black Forest were not as hampered by fallen branches or bushes as I’ve found it to be, trying to venture even a few steps outside behind my study. The decayed debris found in most American ‘woods’ simply doesn’t exist in the nearby woods in Europe where villagers have been scouring for firewood since God invented winter. Once you step out of town, most of the landscape of the Hudson Valley is still unkempt. McEntee and his “school” mates often depict this wildness, but even more often depict their forefront focal points as oddly ‘neatened’ up. Almost as if they chose a spot and, armed with rakes and baskets, cleaned the place up so that their posed figures would not be too uncomfortable. Then, in the surrounding mid- and backgrounds, their hands loosen up and brushstrokes become a bit less fussy. Nothing sublime about a Nature that repels you from getting too close, after all. There are times, however, when ‘wild and messy’ is sublime in an awesome way: a cloud strewn sky at sunset, for instance — and most of the Hudson River/Catskill Mountain painters knew when to let Nature have its own way. 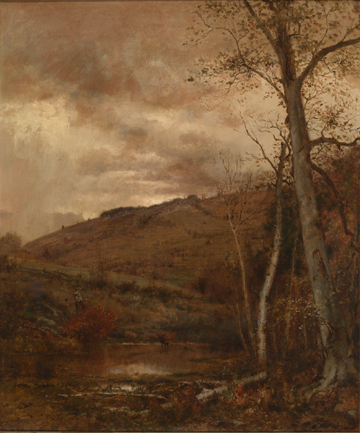 Whatever your own predilections, a slow, quiet stroll through McEntee’s vision of Nature is certainly a true breath of fresh air. Kudos to Lee Vedder and all the others who made this exhibition at the Dorsky Museum a reality for all to enjoy. Go treat yourself! A concurrent McEntee exhibition, “Jervis McEntee: Kingston’s Artist of the Hudson River School” is on view at The Friends of Historic Kingston, Corner of Main & Wall Streets, Kingston, NY 845-339-0720 (thru Dec 31). http://www.fohk.org. You are currently browsing the Raymond J. Steiner's Blog blog archives for October, 2015.